The current Ali Edwards Story Kit™ theme is Review. Often I focus on a specific day or moment in my storytelling, so I was glad for the prompt and opportunity to do a Year in Review layout - which I don't think I've ever done before! I went through my photos and picked one for each month. I chose the photos based on how much I loved the photo and/or how much impact a particular event or moment had in my life. 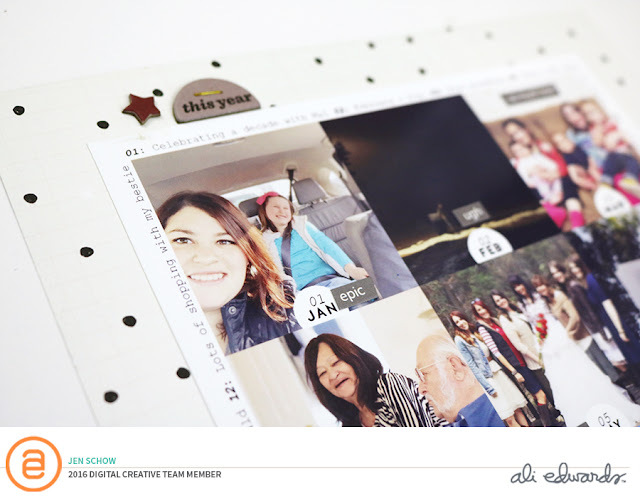 I created a grid of my photos in Photoshop using the Ali Edwards December Stories 6 x 8 Layered Templates Vol. 3, which made my photos 2 x 2. 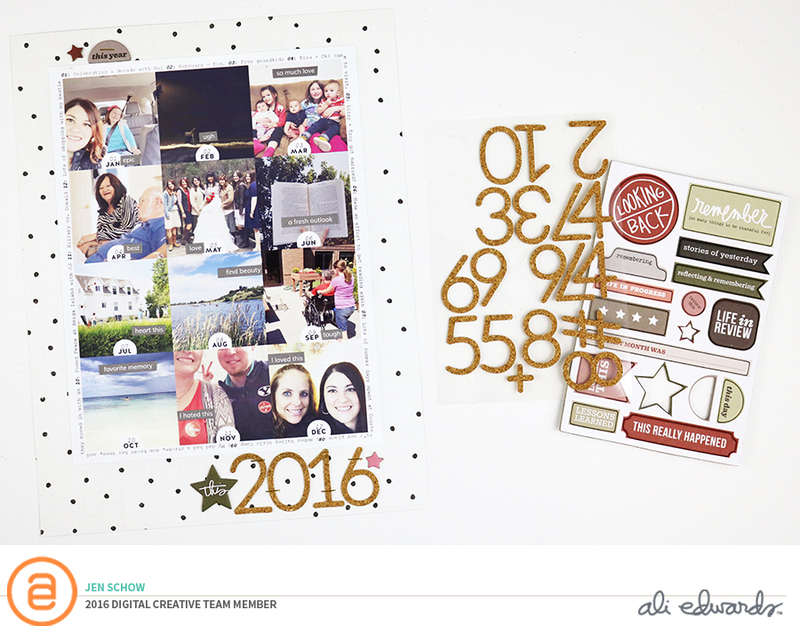 I added the month circles from the embellishments included in the Review Digital Story Kit™. They come as a sort of brown color, but I recolored them to black and white and added a number above each to represent the month. 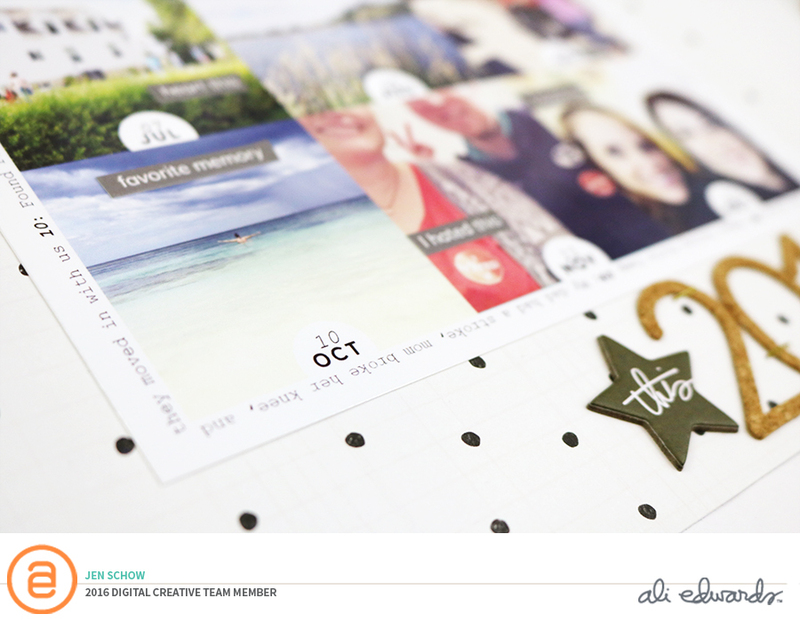 I added numbered journaling around the block of photos to just put a small amount of journaling about each month. I added word strips and some chipboard and cork from the physical Review Story Kit™ and used some patterned paper from Maggie Holmes on the background. Love this little glimpse into our year and I hope I can remember to try to do a layout like this each year. Seeing all of the photos together tells a different story than the individual layouts about each event or moment. Thanks so much for stopping by and you can check out and purchase the Review Story Kit™ until the new kit (Numbers!) is revealed on January 15, 2017. This is a very, very nice layout. Clever of you to use both digital and physical kits. And I really love the journaling around the border of the layout. Wonderful! Jen, How did you do the journaling around the photos? Typewriter? Or, was this done digitally somehow?